Not feeling holly jolly during the season? You’re not alone. Twinkling lights, cheerful music, boxes tied in big red bows, and cookies shaped like snowmen should be enough to lift anyone’s spirit, right? Wrong. 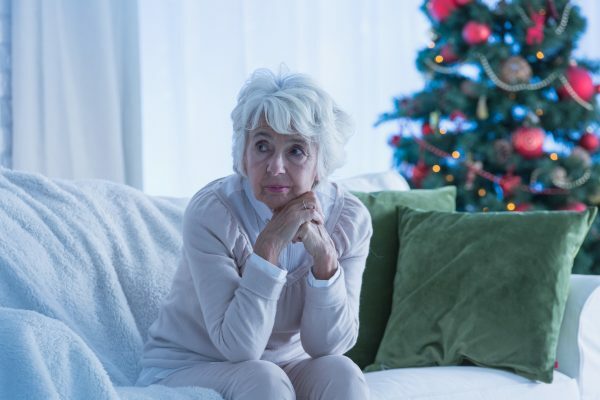 Stress and depression during the holiday season are not uncommon, especially for those transitioning into assisted living, caregivers struggling to meet a loved one’s needs or those who have lost a family member. What are the Holiday Blues? Close your eyes and remember a Christmas morning as a child. The room where you opened gifts, the traditional feast and the faces around the dinner table. The memory fills you with comfort and joy until you open your eyes and look around to find that the room is smaller, the meal is missing a special recipe and the chair at the head of the table where your loved one once sat is now empty. This feeling can make, what should be a joyous season, a time of sadness. If you’re feeling sad around the holidays, there is sometimes a logical reason. SAD is a type of depression that is associated with the changes in seasons. If you start to feel extra moody or depressed in the fall, and it vanishes after winter, then you may suffer from SAD. Some label this the “winter blues” or a “seasonal funk,” but don’t ignore this yearly depression. The exact cause of SAD is unknown, but it can be attributed to lack of sunlight which interrupts your body’s internal clock and can reduce serotonin levels which affects your mood. Light therapy: Sitting close to a special light that mimics natural sunlight and can cause a change in brain chemicals. Psychotherapy: Cognitive behavioral therapy to identify and change negative thought patterns. Lifestyle remedies: You can change your environment by opening blinds to let in more sunlight or rearrange furniture to be closer to a bright window. You can also change your daily routine to make time for an outdoor walk to soak up some sunlight and get exercise which can relieve stress and anxiety. According to Clinical Psychologist, Dr. Joan Vail of IntelliHealth, here are a few steps to take to help prevent seasonal depression. Acknowledge your Feelings: Understand that there is no “right” way to feel. Take time to express your feelings. If your loved one lives in an assisted living community, call the community to ask about support groups. Reach Out: If you feel lonely, reach out and find a way to get involved in your community. Find a way to help others which will in turn help yourself feel like a part of something. A local assisted living community or nursing home may have volunteer opportunities. Be Realistic: Don’t except the holidays to be like they’ve always been. Incorporate some old traditions but accept change by creating new traditions. Set Aside Differences: Family strife can escalate stress. Do your best to accept family and friends as they are. Don’t try to work through differences during the holidays. Stick to your Budget: Create a budget in advance. Before the season hits, decide how much money to spend on gifts, food and other holiday events. Make a Plan: Schedule your holiday plans by setting specific days to tackle holiday shopping, volunteer days and visits to family members in senior living communities. Call your loved one’s assisted living community in advance to ask about holiday parties and dinners that you can add to your calendar. Learn to Say No: Don’t get overwhelmed by taking on too many obligations. If you say “yes” when it should be a “no” you’ll feel resentful and overwhelmed. Stick to Healthy Habits: Overindulgence adds to stress and guilt. If you are following a healthy eating plan, don’t fall off track just because it’s the holidays. Get plenty of sleep, incorporate physical activity into your daily routine and try eating a snack before attending a holiday party so you don’t overeat. Take a Breather: During the busy holiday season, it may be hard to make time for yourself, but this is vital. Spend a few minutes alone as a refresher. Focus on slowing your breathing and clearing your mind by listening to calming music, reading a book or getting a massage. This is especially important for caregivers. Be nicer to others: Try being kind to those you interact with throughout your day. Run an errand for a loved one in an assisted living community or an elderly neighbor who lives alone. Research shows that when you show sincere kindness toward another person, it activates the portion of your brain that helps feel pleasure. This also may spread the spirit of kindness to others. Go on, give it a try! Meditate: Sit quietly and think positive, loving thoughts. This type of meditation has been proven to enlarge the part of the brain that regulates emotions which can help you maintain happy feelings. Exercise: Research shows that exercising can make you happier. One study showed that older adults who began exercising regularly reported that, after eight weeks, they felt significantly happier, according to the Mayo Clinic. Develop a Positive Mindset: By working on gratitude and forgiveness, you can become happier and more satisfied with life. Always consult a medical professional with feelings of depression, stress and anxiety, and don’t allow the holiday season to get you down. Start implementing these tips to your everyday life and watch how the light may come back into your life this season. Keep in touch with the latest Buffalo Crossings news, photos and more!